Join us for the Member's Opening of Sarah Cain: The Imaginary Architecture of Love. 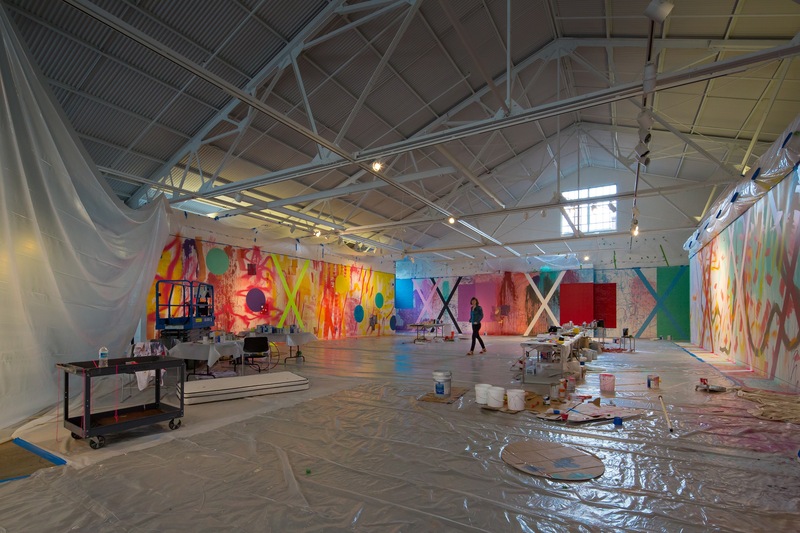 CAM Raleigh (Contemporary Art Museum) is pleased to present The Imaginary Architecture of Love by Sarah Cain. Cain has created a monumental painting directly on the walls and floor of the Main Gallery. As is typical of her practice, Cain has embedded objects found in situ and layer paintings made on traditional stretched canvases within the work. Cain is committed to translating lived experience into a language of color and form. Her investment in abstraction is based on her belief in its capacity to express ideas that are beyond language. Building upon a present tense call-and response to the environment at hand, Cain attempts to expand the potential of painting by challenging its conventions. In advance of making a work on site, Cain gathers materials, inspiration, and visual cues from the outside world. Through improvisation based on her gathered materials and impressions, she makes decisions about the palette, gestures, and composition on site. The Imaginary Architecture of Love will flow from the museum's entrance lobby into the main gallery, moving through the former produce warehouse's corners and cracks while responding to structural details such as arched windows and poured-in-place columns.